Are you or someone you know looking for a convenient, inexpensive and delicious way to feed a group of people? Haven’t you learned by now that pizza (as long as it is Papa John’s pizza) is always the answer! Give Papa John’s Tri-Cities a call, we have excellent catering options that will fit your needs, whether you are having a business meeting, social gathering, sports banquet, graduation party, etc. There are several reasons why you should consider Papa John’s pizza next time you need to feed a group of people. Service and Convenience. With Papa John’s you know you can expect to receive great customer service from our fantastic staff! We will work with you individually to assess your needs and come up with the perfect package to feed your crowd. You can tell us exactly what you want or just let us know how many people your feeding and we can make recommendations for you. The whole experience will offer convenience from start to finish. Place your order and leave the rest to us. We can deliver the food straight to you and with it bring plates and napkins. Your pizza and sides will arrive hot and fresh while your beverages are nice and cold. One of the great conveniences of pizza is that you don’t need utensils or condiments! Just grab a plate and a slice and enjoy. This also means clean up is easy! Price. 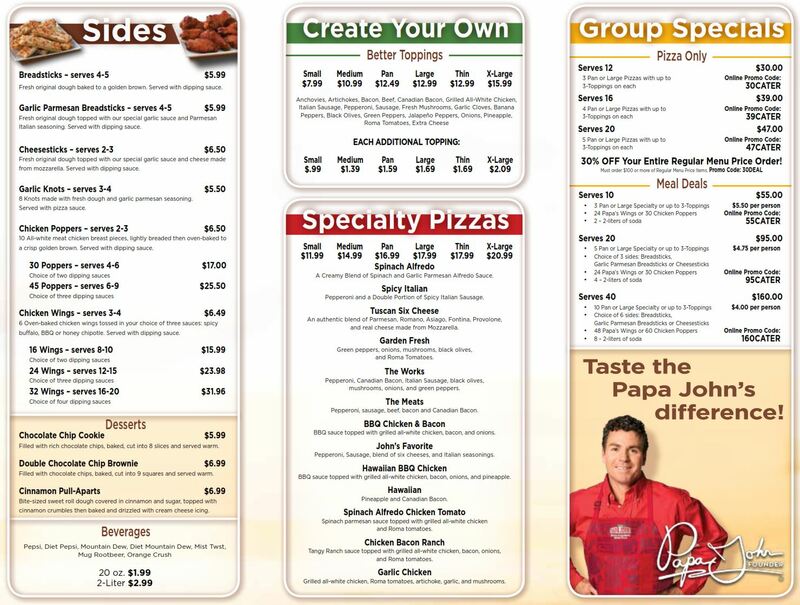 Take a look at our catering menu and you will find that it is actually quite affordable to order pizza for your group! Our prices are very competitive and often beat out other common catering food choices out there! You can get catering deals for as little as $2.50 per person. Something for Everyone. Take a look at our catering menu and you will find there are an abundance of options to fit anyone’s needs and/or desires! From our quality, hot, fresh pizzas topped however you like, to our delicious sides, desserts and beverages; everyone is sure to leave satisfied. If you want to make sure all your guests can eat to their heart’s desire, you might want to consider our new catering option: All You Can Eat! Give us the details and we will give you the right combination of pizzas and sides to make sure your guests do not feel limited! Your Papa John’s is here to meet your needs! You really can’t go wrong with Papa John’s! Please give us a call if you are planning an event. Maybe you aren’t planning a gathering, but you know someone who is, do them and us a favor and send them our way! Call your local Papa John’s Tri-Cities now and let us make your life easier and more delicious!